Here's the part on Nino with the director in charge of his Arashi ni Shiyagare segment! Reading these made me feel like they're very well matched with their respective directors. Read on for the praise that gets heaped upon Nino this time! thanks for this. :) Nino's segment is really interesting. I was really fun to watch especially when he cleaned the building windows. oh my, the director really praised nino ne?! "The only time I saw him look nervous was prior to his window cleaning appearance at the Abeno Harukas building. For one brief instant, I felt like I saw a Ninomiya Kazunari that was different from the Ninomiya Kazunari we know. That was the first time I ever saw him with that sort of expression." HIS FEAR OF HEIGHT IS ACTUALLY OVERSHADOWED BY SHO. BUT THAT PART REALLY WAS SCARY THOUGH! "In terms of my personal ambition in the future, I would like to see Ninomiya-san come apart at the seams (laugh). Whether it's seeing him panicked or scared or touched, I would love to draw out that side of him since he's the sort of person who doesn't have a lot of emotional ups and downs" I ALSO WANT TO SEE THIS!! 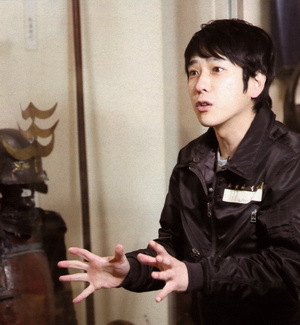 !NINO RARELY DISPLAYED HIS TRUE EMOTION NE! HE IS VERY IN CHECK WITH HIS EMOTION, WHAT A WALL HE PUT UP NE. SOMEHOW I LOVR THAT SIDE OF HIM. NOT ANYONE CAN SEE THIS VULNERABLE SIDE OF ME, THAT KIND OF THOUGHT. I watched the headpiece and the katakana episode and wow! Nino is good!! It was so nice reading this! thank you so much for translating and hope you have a nice weekend! this was really interesting, thank you for translating! oh, what a great insight of him from other people point of view. I enjoyed this so much - it reaffirmed what I feel about Nino's personality and gave an insight into the frustration that those around Nino feel about seeing his vulnerable side. I feel like we sometimes see this vulnerable side in his acting and it packs extra punch. thank-you for translating. wow this is lovely. thank you for sharing! Welcome to say_it_again, the translations journal of Hwen (on indefinite hiatus) and Amy! Please check out our user info for profiles, important notes and rules and more-- or, if you're only interested in the translations, try our memories or tags. This is a 100% public journal but we do sometimes post here without cross-posting to related communities, so feel free to add us if you like!